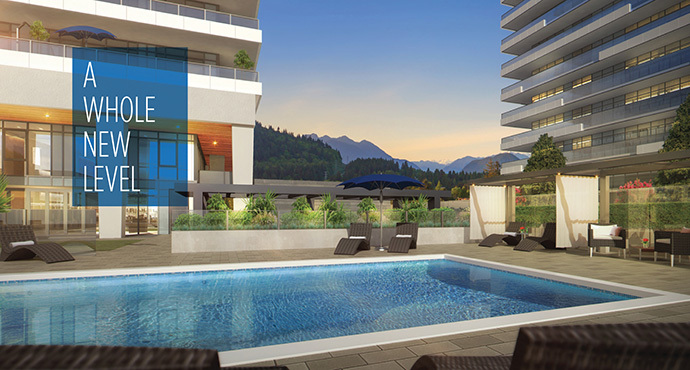 The Vancouver Condo Buzz » SPECTACULAR Master-Planned Transit-Oriented West Coquitlam LOUGHEED HEIGHTS Condo Development Now Selling! 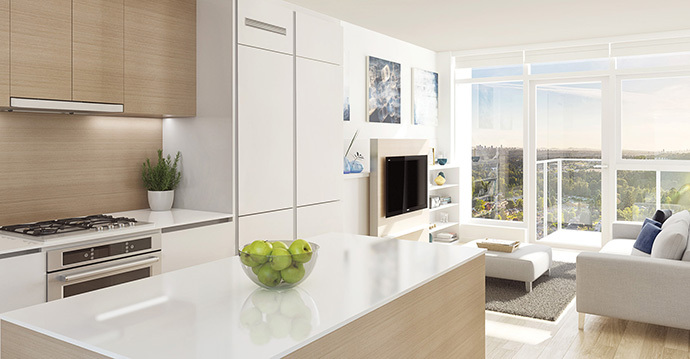 « DESIGN-LED HOMES at THE JERVIS Vancouver West End Condos for Sale! A new master-planned community in the West Coquitlam real estate market is now taking shape. It’s called Lougheed Heights by BlueSky Properties. 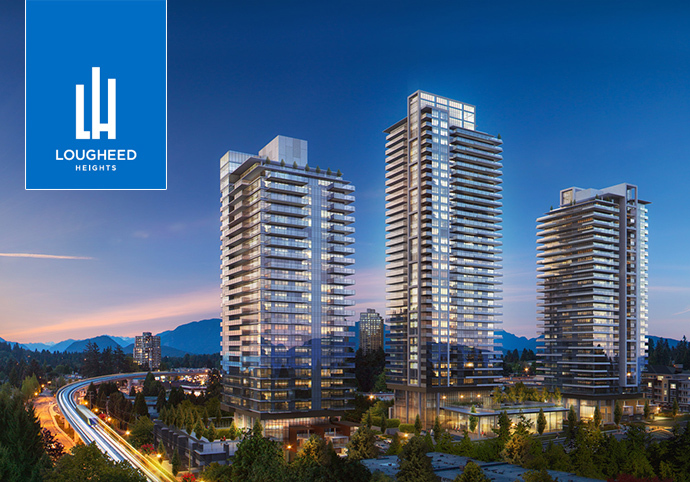 Marketed as an innovated development, the BlueSky Lougheed Heights Coquitlam condo towers will present a new urban living experience for residents. From the 24,000 square foot social and health focused amenity spaces to the BosaSPACE responsive floor plans, the truly unique and exciting new project is now in pre-sales! 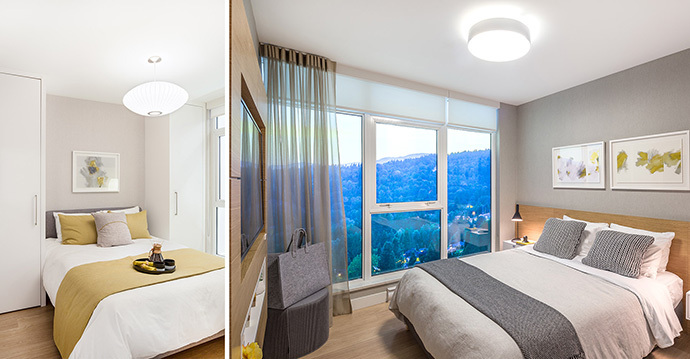 Located at Como Lake Avenue and Clarke Road, the new West Coquitlam Lougheed Heights by BOSA/BlueSky Properties is also just steps away from the new Evergreen SkyTrain line, that will connect you to all points through the Metro Vancouver area. Some of the initial highlights of the innovative project includes an outdoor swimming pool and expansive pool deck area, outdoor fireside lounges, music rooms, fitness centre on-site, gym facilities, sauna, steam rooms and outdoor entertainment areas. 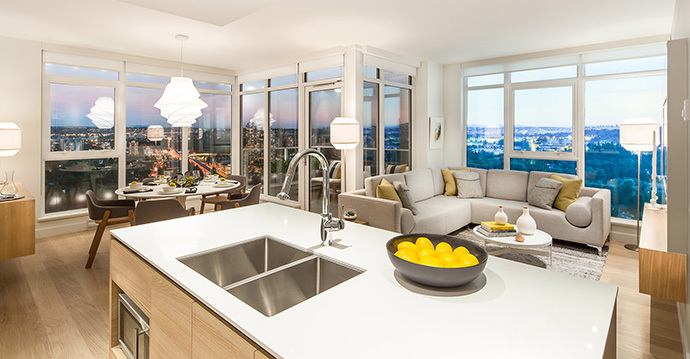 Also, the master planned Lougheed Heights Coquitlam pre-sales condos will give you flexible living space, expansive floor plans, views from many levels, premium finishes and much more living space for your money. West Coquitlam real estate market is already on the rise, as it borders along Burnaby and has close proximity to the Tri-Cities areas and downtown Vancouver. Easy access to SFU, Richmond, North Road, Austin Heights and Lougheed Town Centre are other community highlights. The elevated concept of urban living spaces at the presales Coquitlam Lougheed Heights condos is most impressive through the collaboration of 2 notable local developers in BlueSky Properties and Bosa Properties that are reputable and well known for their quality finishes, attention to detail, solid reputation and customer service. The Lougheed Heights sales centre is located at 581 Clarke Road Coquitlam (at Como Lake Avenue) and they are open daily from 12 noon to 5pm. For more information about this master planned development, please visit http://blueskyproperties.ca/lougheed/. From the Developer: LEADING THE WAY! At BlueSky Properties, we think without limits. We innovate, we pioneer and we transform neighbourhoods. Our ideas are fueled by over five decades of experience and backed by the Bosa name. This fall, our newest offering, Lougheed Heights in West Coquitlam real estate market, will begin to transform this entire neighbourhood into one of Metro Vancouver’s most important urban centres. Steps from SkyTrain, these innovative 1, 2 and 3 bedroom homes offering striking views and over 15,000 square feet of amenities. Leaders will see it first. Count yourself among them. 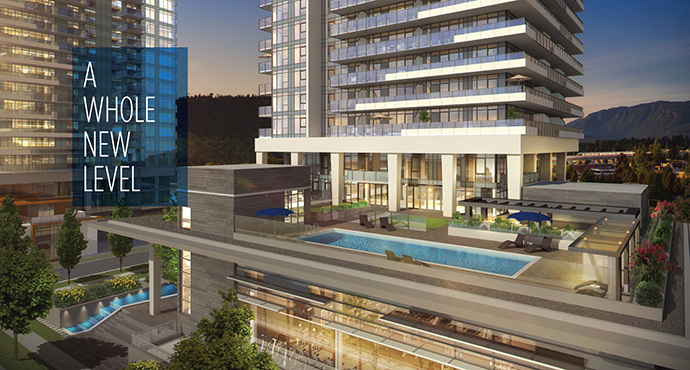 The BlueSky Lougheed Heights Coquitlam condo development is coming early 2016. West Coquitlam is set to be one of Metro Vancouver’s most important communities – and soon, Lougheed Heights’ three sleek, striking towers will soar high above with fantastic city, offering views, resort-inspired amenities, stunning interiors, and the quality finishings you expect from a Bosa Family Company. 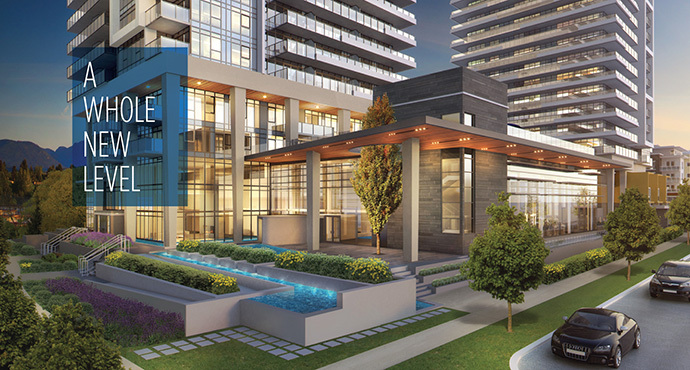 Aside from the incredible amenities and master-planning at Lougheed Heights, the project will also feature luxurious interior finishes and spacious homes. There will be a choice of three contemporary designer colour palettes, named Aspen, North and Foster. You can determine the palette that you want for your home during the pre-sales phase. Also, there are discreet and stylish roller shades throughout the homes for added privacy and durable/seamless wood laminate floors throughout. The residences will also have expansive windows with two-toned frame. The beautiful bathrooms will feature luxurious soaker tub with integral shower, master ensuite with freestanding shower and custom vanity cabinetry with storage shelf and sliding mirror. Other bath features include composite stone counters, Vitreous china square undermounted sink and solid brass Grohe single lever faucet. The flooring is hand set porcelain tile and there is recessed lighting above the water closet and tub/shower. The storage cabinetry is contemporary wood grain finished. The beautiful 1 bedroom kitchens will feature 24” integrated fridge with bottom mount freezer, 24” gas cook top, premium slide out hood fan, sleek dishwasher with integrated panel, and convection wall oven. The 2 bedroom floor plans will feature 30” stainless steel fridge with bottom mount freezer, 24” or 30” gas cooktop and convection wall oven, premium slide out hood fan and dishwasher with integrated door panel. The kitchen features include stylish task lights, contemporary wood grain finish on upper cabinetry, kitchen islands and backsplashes, modern matte white lacquered lower cabinetry, premium soft close doors and retractable drawer slide mechanisms, USB charging plug, solid brass Hansgrohe kitchen faucet and composite stone counters. All homes also come with a laundry closet with front loading stacked washer and dryer. Here are some of our favourite Lougheed Heights floor plans. Please speak with your agent and the sales team to find out more about availability, pricing and specific features of each layout. An expansive 24,000 square foot private resort inspired clubhouse awaits residents and guests at the Club BlueSky at Lougheed Heights Coquitlam. Here, you can enjoy the basketball and hockey sports court, music conservatory rooms, poolside terrace featuring fire pit, harvest table, BBQ areas and heated outdoor swimming pool with loungers and cabanas. As well, Club BlueSky features a theatre room with projector screen and club seats, private dining space with chef’s kitchen, fully equipped training gym and fireside entertainment lounge and games room with soft seating and a large screen television. The other amenities at Lougheed Heights Coquitlam includes a business centre with multi-purpose boardroom, study areas, outdoor children’s play area, dramatic two storey lobby with fireplace and reflecting ponds, full time concierge, private mailroom, BosaFRESH room which is a purpose built facility at lobby level, temperature controlled an secure for grocery delivery service in addition to BosaVOLT dedicated electric vehicle charging stations.